Short skirts, fist fights and the world’s first side eye. 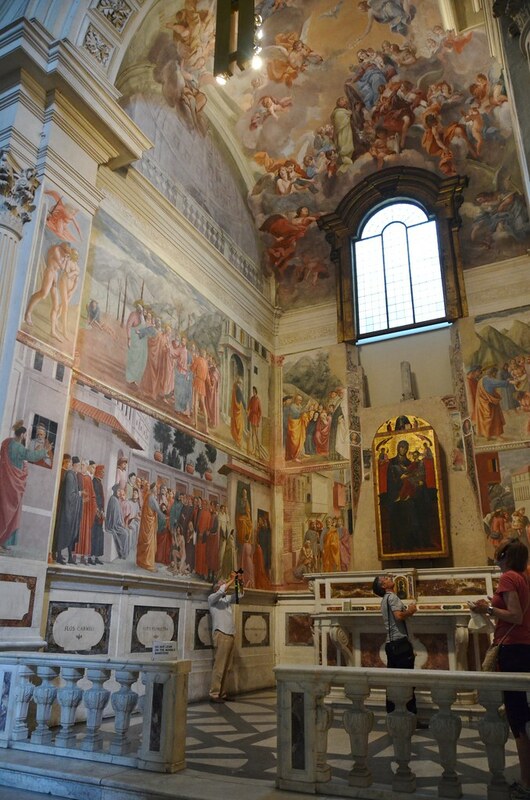 Today, we’re going to the Brancacci Chapel – and I promise, it’s so much more than your study abroad art history assignment. While normally the Brancacci Chapel would leave a whopping 4 euro dent in your wallet, we’re going the stingy way, per usual, and taking you there on a free museum Sunday! Although the Brancacci Chapel will be welcoming eager eyes like yours free of charge this Sunday, don’t think you can go waltzing in just yet. Because the chapel is such a tiny Florentine treasure, only a restricted number of people are allowed in the space at a time for 15 minute intervals. So before your visit call +39 055 2768224 and secure your spot sometime between 1 pm and 5 pm. The Brancacci Chapel is located in Santa Maria del Carmine in the Oltrarno. This chapel of masterpieces is set in an unassuming church in a snoozy neighborhood in the Oltrarno. Against this humble setting, Brancacci Chapel is truly a wonderful surprise. From our hub of Piazza della Signoria head west toward Via Por Santa Maria. Take a left and cross the Ponte Vecchio. 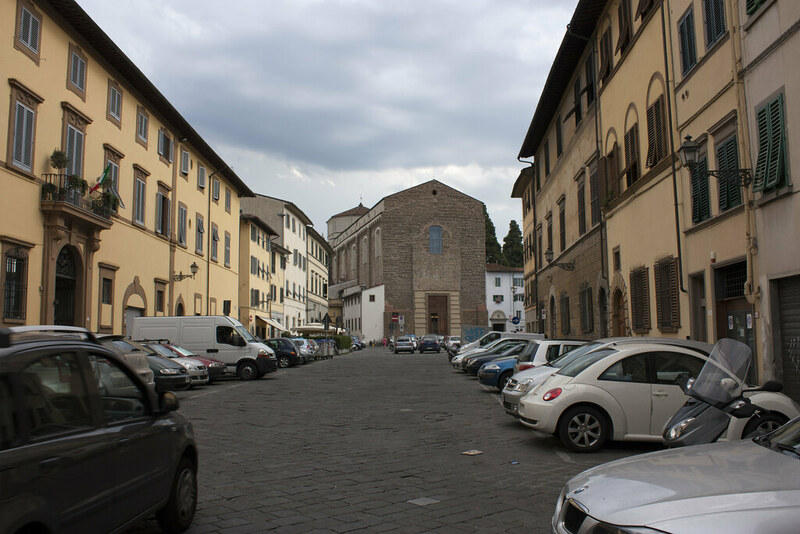 Once in the Oltrarno take your first right onto Borgo San Jacopo, which will turn into Via Santo Spirito, which will turn into Borgo San Frediano (basically just stay straight and don’t panic when the street names change). Turn left into Piazza del Carmine (blue signs will help guide the way). The church with the bare facade is where you’re headed and a small door to the right of the main entrance is where you want to be. Snag your tickets at the ticket counter and then head into the cloister toward the gift shop. Attendants will let you know when your time is up. So what exactly are you headed in for? The Brancacci Chapel was commissioned for the affluent Brancacci family in their parish church during the 15th century. In 1424 Felice Brancacci decided to decorate the walls of the family chapel with a fresco cycle depicting scenes from the life of St. Peter. Although Masolino was commissioned to complete the work, the chapel today is most commonly associated with, and studied as a masterpiece by Masaccio. What gives? This is a classic case of the student outdoing the master. 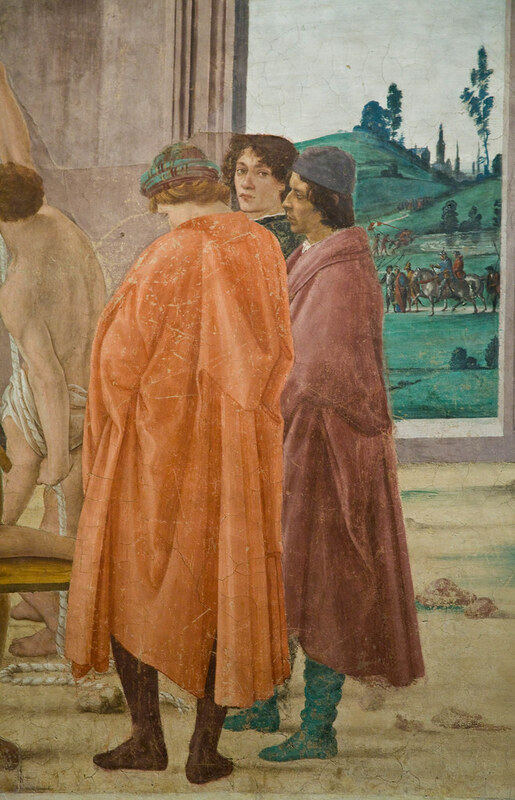 Twenty-one-year-old Masaccio was given portions of the frescoes that his master Masolino deemed unimportant – a practice field for the inexperienced artist. However, it was Masaccio’s “practicing” that caught the attention of the masses, and some argue, helped kick off the entire movement of the Renaissance. Masaccio’s revolutionary use of linear perspective, shadow, chiaroscuro and the expression of raw human emotion lit the match under the Renaissance. No longer were artists confined by the strict, delicate style of the International Gothic movement, but rather, inspired to explore more realistic human emotions and movement. Masaccio changed the direction of art all before his untimely death at only 26 years old. Although Masolino “historically” left the project for another commission, it seems to me more likely he was feeling a little overshadowed (no pun intended!) by his talented pupil. Masaccio took the reigns for a brief period, but he too left for Rome for another commission and died shortly thereafter, leaving the chapel unfinished. Almost 60 years later Filippino Lippi took things up where the boys left off. In the year 1771 a devastating fire struck Santa Maria del Carmine ruining almost the entire church. Miraculously, these masterpieces were spared. **Note, disregard the whirling, swirling, Baroqued-out heaven painted on the ceiling. It’s not that cool and was completed at a much later date. Begin your artistic journey with Masaccio and Co., facing the back of the chapel. Turn to your right to see Masolino’s painting of Adam and Eve. I could start waxing on about how Masolino and the International Gothic style, but INSTEAD let’s talk about Eve’s side eye. She’s totally annoyed that Adam isn’t digging into that apple. But shouldn’t she be concerned about the snake with the creeepy cherub head creeping up behind her? Side-eye Eve, super chill Adam and cherub head Satan do seem pretty intriguing. 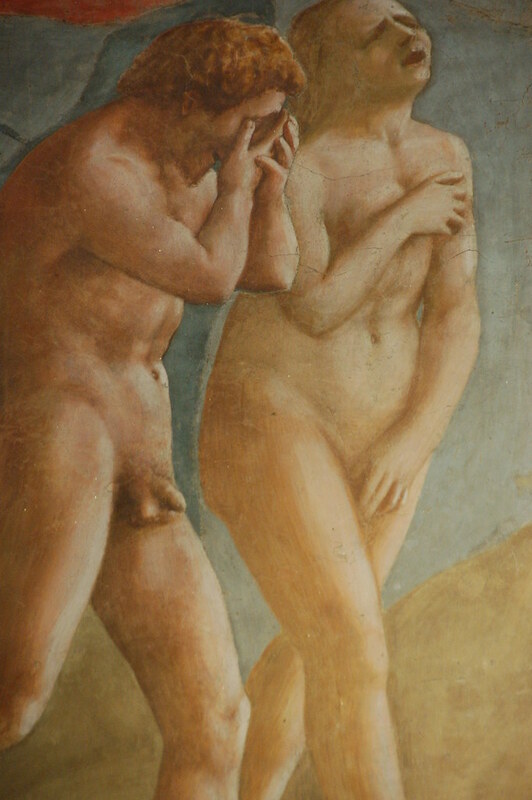 That is, until you do a 180 and find yourself facing Masaccio’s take on the couple as they are banished from the garden. It isn’t hard to see how Masaccio flipped art on it’s head. The absolutely distraught faces of Adam and Eve capture a level of emotion that I believe, few painters have been able to master. Here’s another fun fact about this painting. 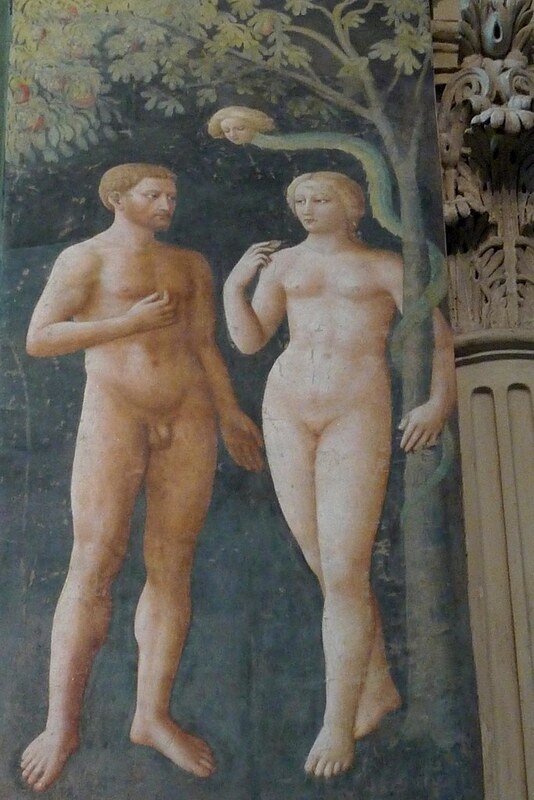 During the ever-so-prude reign of Duke Cosimo III, leaves were painted over Adam and Eve’s bits and pieces (later removed by restorers). Oooo and one last thing I promise! Eve’s pose is almost identical to the Classical Greek Venus Pudica pose. Masaccio starts the ball rolling on the complete and total obsession with the Classical era which defines so much of the Renaissance. To the right of the wailing Adam and Eve is the most famous painting in the Chapel – Tribute Money. The painting is largely attributed to Masaccio (with the exception of Masolino stepping in to do the important parts such as Christ’s face). Although a Biblical scene, politics seep through the paint on this one. Masaccio was working on this wall during a controversial tax reform in Florence (we all know how that goes, am I right?). The image depicts the scene in the gospels in which the tax collector asks Jesus and His apostles for tax to enter the city. Although the Apostles want pull the, “do you realize who you’re talking to?” card, Jesus tells them to chill out and pay the guy. He then sends Peter over to pull a coin out of a the mouth of fish and then take it to the tax collector. As you can tell, Masaccio is bored with the classic comic strip style of telling a story. Rather, he uses one setting to depict all three events of the scene at once. Pretty clever! Moral of the story, Jesus wants you to pay your taxes. And oh my! What short skirts guys! I guess man thigh wasn’t just a thing of the 70’s! Drop down to the row of scenes on the lower register. Here we see, as could be expected, more episodes from the life of St. Peter (hint: Peter can be spotted in each scene as the fellow in the yellow cloak). The center panel is a fun game of Where’s Waldo for the 15th-century Florence history nerd. 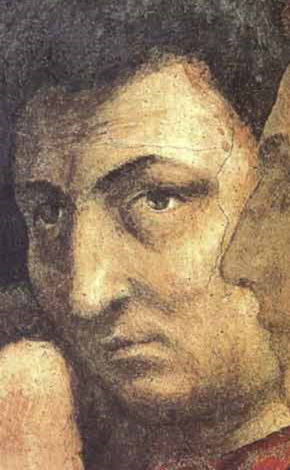 The one we care about though is Masaccio’s selfie. On the right side of the scene we see a group of men gathered around a banner with an image of St. Peter. 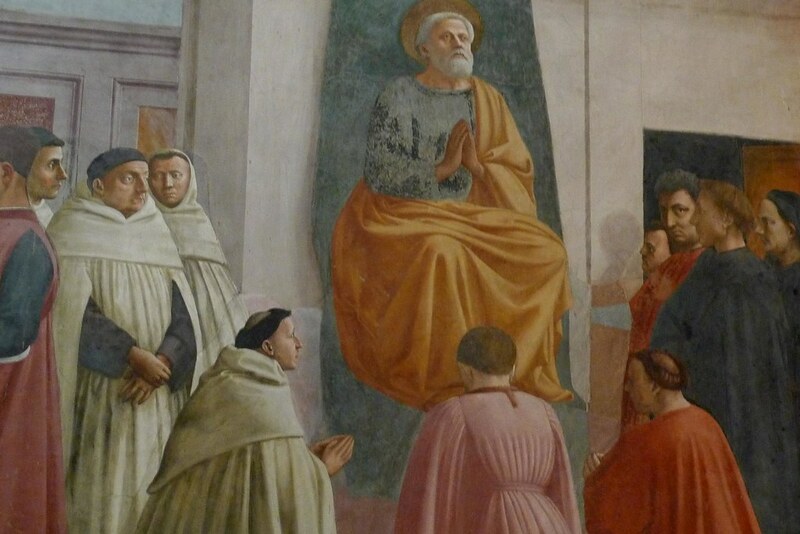 To the right of Peter’s knee sneaky Masaccio, in his red cloak, peeks out to see his many admirers. And with that, do another heel spin 180 degrees to the right wall. On the top register 15th-century architectural historians can eat their hearts out. Florentines loved relocating Biblical events to their backyard, and this is perhaps the best example. Almost every building depicts a specific, palazzo, giving Florentines the warm fuzzies that these mircales are taking place in their very neighborhood! The lower register of this wall belongs entirely to Filippino Lippi who came to finish the job decades later. Filippino decided to do his own who’s who of Florence at the Crucifixion of St. Peter. 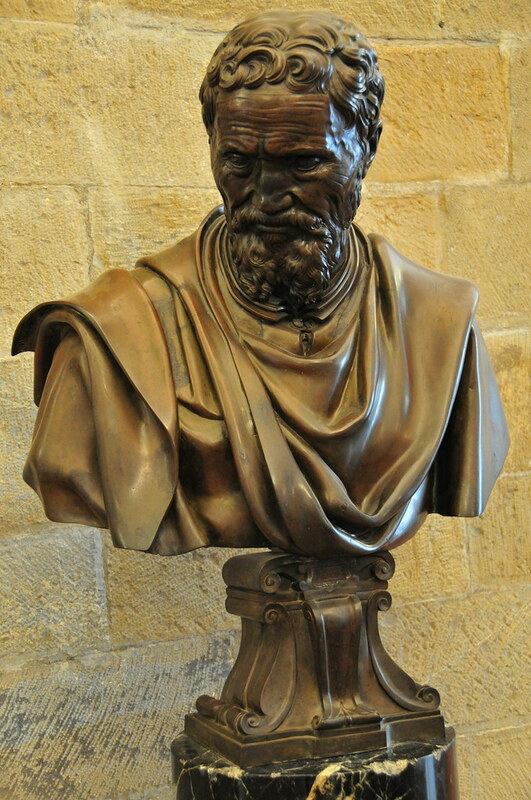 Here he face drops Florentine faves such as Dante, Lorenzo the Magnificent, Botticelli, and Poliziano. But, just like his predecessor, he made sure to throw a selfie in the mix. While books and books and books have been written about the Brancacci Chapel that would give you a load more information than I just did, the cold hard fact of the matter is that you are only granted 15 minutes in this delightful little big piece of the Renaissance. Do your studying ahead of time so you can spend your time looking at the masterpieces rather than reading Rick Steves (not to knock Rick, I love that guy). If TMZ was a company in the Renaissance, I think I definitely would have been a writer. By now there is the good chance that guards are shuffling you out of the chapel, concerned about what your perspiration and breath is doing to the precious paintings. So take one last look, let out an appropriate sigh of awe, and let the next batch of eager onlookers in. Leave with the satisfaction that you got a glimpse into where the whole crazy movement called the Renaissance started. And then get some gelato at Gelateria La Carraia. I don’t know about you, but art makes me hungry! If Rick Steves is smart, he’ll get you and Meg on his staff. Everything makes me hungry for gelato…LOL!